Oregon occupiers live stream insane final stand as FBI prepares final push against refuge. 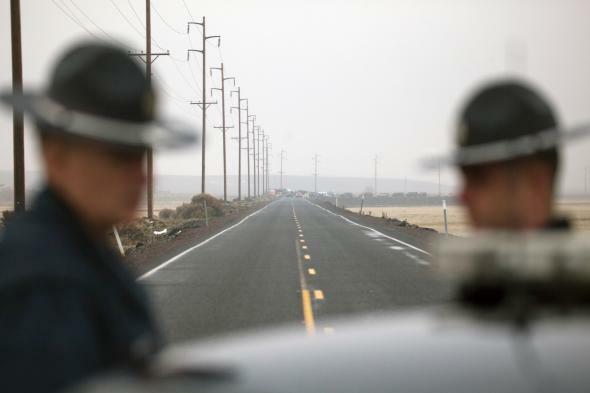 Oregon State Troopers block a road entering the Malheur National Wildlife headquarters on Jan. 28, 2016. “FBI tactical teams had quietly moved into the refuge compound Tuesday night, entering the buildings undetected by the occupiers,” according to the Oregonian. “They apparently were in the buildings through the day Wednesday before agents moved against the encampment.” David Fry, 27, of Ohio, Jeff Banta of Elko, Nevada, and Sean and Sandy Anderson of Riggins, Idaho have remained at the refuge even after Ammon Bundy and others were arrested last month. The four face federal conspiracy charges for the participation in what they call a protest over government overreach on federal land. Listening to the #Oregonstandoff livestream, what stands out is the combination of ideological incoherence and aggressive uncertainty. @Jacob_Brogan "Remember Braveheart?" asks one "Braveheart took it to the end even when they tortured him because he believed so strongly..."